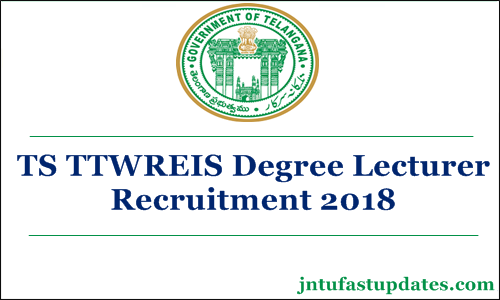 Telangana Gurukulam Degree Lecturer Recruitment 2018: TS TTWREIS has invited Online applications from qualified candidates through the proforma Application to be made available on Board’s WEBSITE (www.treirb.telangana.gov.in) to the post of Degree College Lecturers in Residential Educational Institutions Societies. Degree College Lecturer in Telangana Tribal Welfare Residential Educational Institutions Society. Degree College Lecturer in Telangana Social Welfare Residential Educational Institutions Society. (Remittance of Fee) Each applicant must pay Rs.1200/- (Rupees Twelve Hundred Only) towards Application Processing Fee and Examination Fee. However local applicants of Telangana State belonging to SC, ST, BC and PH have to pay Rs.600/- (Rupees Six Hundred Only) each towards application processing fee and examination fee. Failure to pay the examination fee will entail total rejection of application. The Applicants have to read the User Guide for Online Submission of Applications and then proceed further. More details click notification.